For me, summer is the season of light and quick pasta salads. I make them for everything. They work great as a light outside dinner during the week, or you can take them for work lunches, or take them to a picnic or barbecue. I find that these salads work best if you A) avoid mayo or cream based dressing. I know those are popular in supermarket pasta salad, but for a light meal I prefer a simpler dressing. B) You need the right ratio of pasta to add-ins. A pound of pasta is a lot and you would need to have a lot of add-ins to make it work. For recipes like this I like to use just eight ounces of pasta the recipe is nicely balanced and feels lighter. It’s a quick recipe with not much prep. 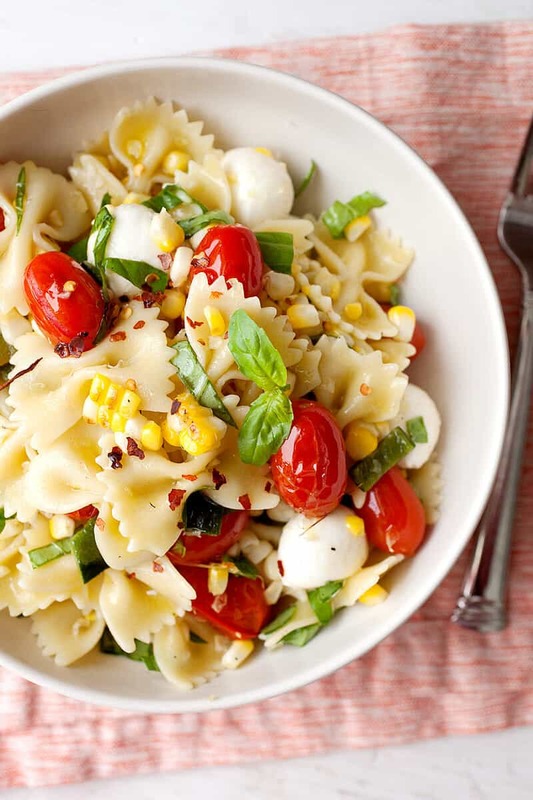 Most of the cooking is done on the grill so you really only have to dirty one pot to cook this grilled tomato and corn pasta salad! 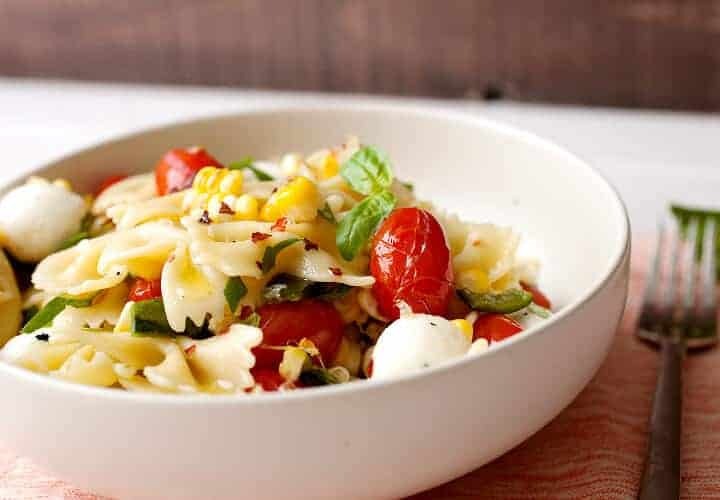 A perfect summer pasta salad with blistered grape tomatoes, charred sweet corn, and fresh mozzarella balls. 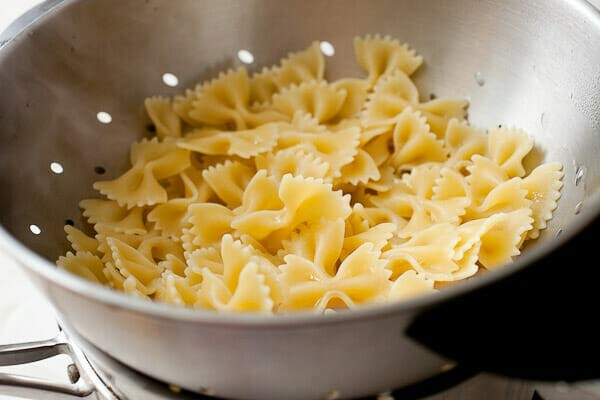 1) Cook bowtie pasta according to directions. Once cooked, drain and rinse with cold water to stop cooking. 2) Peel husk off of corn ears. 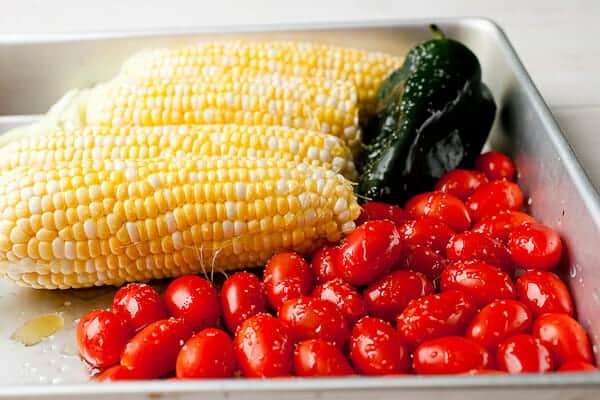 Toss corn, tomatoes, and poblano with a drizzle of olive oil and season with salt and pepper. 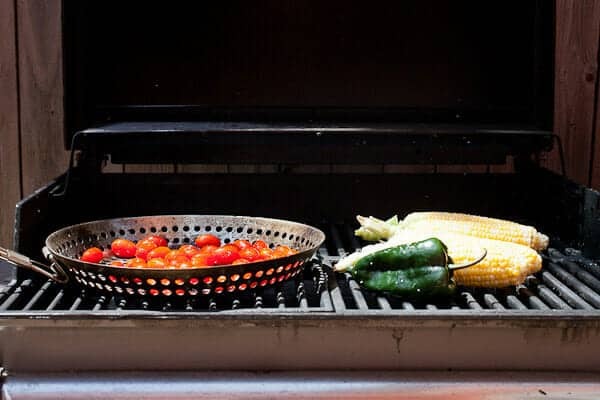 Grill veggies over HIGH heat until they are charred and blistered. Tomatoes will take 3-4 minutes, poblano, 5-6 minutes, and corn the longest at 7-8 minutes. Turn occasionally to make sure veggies are cooking evenly. 3) Remove veggies from the grill and let cool slightly. Peel poblano pepper and cut corn off the cob. 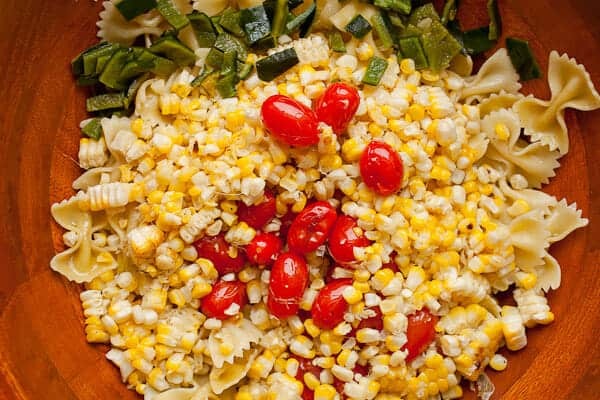 4) Toss veggies with bowtie pasta and add 3 tablespoons of olive oil and red wine vinegar. Stir in mozzarella and season with red pepper flakes, fresh basil, salt and pepper. The things you need to grill here are pretty straightforward. I recommend shucking the corn so the kernels can get a bit blistered on the grill. Drizzle everything with olive oil and a pinch of salt. Grill these veggies over HIGH heat. You can really blast them with heat. The tomatoes will need just a few minutes. You want them bursting but not mushy at all. The pepper should be charred all over so the skin can be peeled later. The corn will take the longest (7-8 minutes) to get the right char. It’s hard to overcook the corn. The only other thing you need to cook is the pasta! Any non-spaghetti will work for this pasta salad. You could use macaroni but I like bowtie pasta personally. 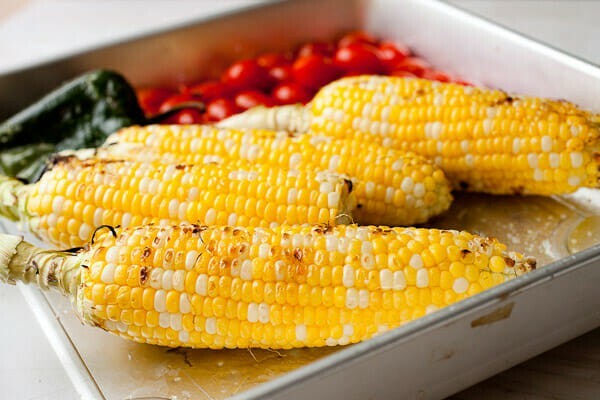 When the veggies come off the grill, let them cool briefly before prepping them. Cut the kernels off the corn, peel and dice the poblano pepper (adds a little heat to the salad) and you can just leave the tomatoes whole or cut them in half. Personally I like to leave them whole. Now that’s a great ratio of pasta to add-ins! Toss in the mozzarella (I like the little fresh mozzarella balls) and season the salad with red pepper flakes, salt, pepper, and fresh basil. Drizzle the pasta with olive oil and red wine vinegar for a quick dressing and you’re all set. 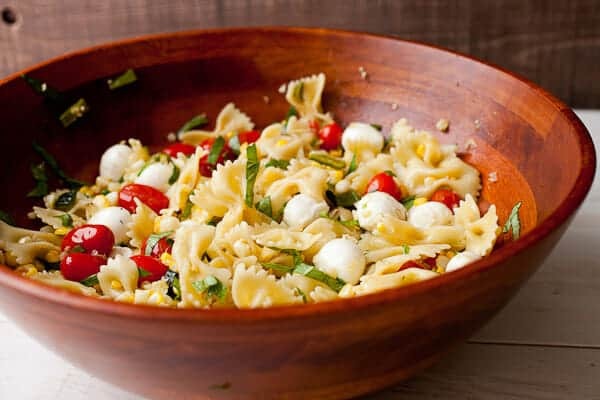 It’s a super fresh and bright tasting pasta salad. I ate this version for multiple meals during the week and never got sick of it! This looks amazing. The perfect potluck pasta!